When I graduated college, my mom and aunt Judy took me on a trip to France: one week in Paris and one week in Provence. It was an amazing trip, and I can’t wait to go back…Paris is definitely my favorite city, out of all the cities I’ve visited. The food was probably the best part for me…we pretty much planned our days around meals and restaurant locations. But one thing that has always stood out to me (besides the croissants that we had in Montmartre) was the strawberry tart that I bought on a whim in a little pastry shop around the corner from our hotel. Whenever you get a tart in the U.S., it looks beautiful, but there isn’t much flavor. This tart tasted like it looked. It was absolutely gorgeous, with ruby red whole strawberries coated in a glossy glaze, rich pastry cream, and the crust was the best of all–it was buttery, slightly sweet, and crispy. I’ve never had a tart shell like it…it was almost like it was made partly out of graham crackers or maybe brown sugar. Anyway, it lasted only about 1 minute, and I’ve never had one like it since. 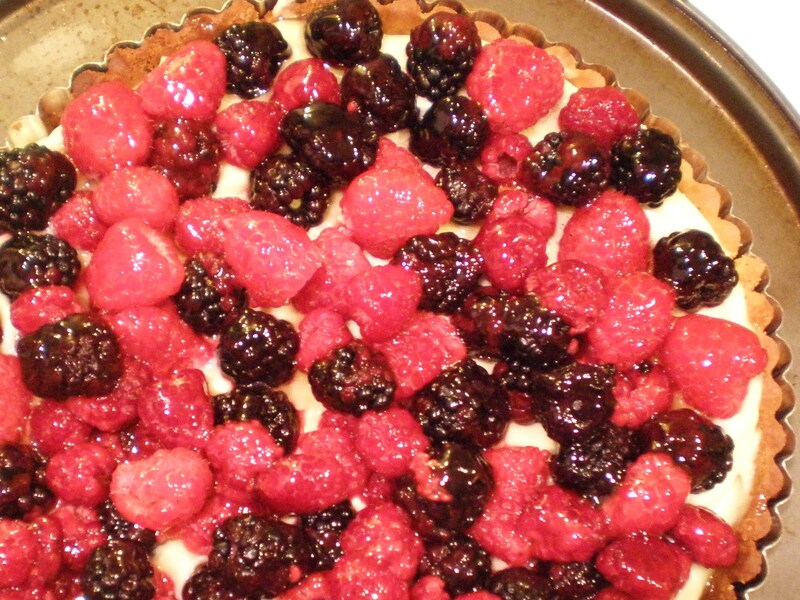 I’ve been wanting to attempt recreating this tart since, but never really had the tools (no tart pan), and was a little bit overwhelmed by it. I don’t know why…I make cakes from scratch often, and I’ve been making pies since I was about 12…but for some reason a tart seemed too daunting. But within the past year or so, since my kitchen was remodeled and I’m baking more often again, it’s been on my mind. Then my mom got me a tart pan for my birthday, so I started looking for recipes. I went to my favorite source for trying something new, Cook’s Illustrated. Their instructions are so specific and detailed for everything, so I always like to use their recipes for my new cooking endeavors. This recipe claimed to be for a tart that tasted as good as it looked, unlike most bakery tarts, which was another reason I used it. Since strawberries aren’t in season anymore, and the farmer’s market was overflowing with raspberries and blackberries, I went for a mixed berry tart. It did taste as good as it looked!! It was absolutely delicious. The crust wasn’t the same as the one I had in France, and now that I’ve made one tart, I’m going to start trying others…but this crust was pretty perfect (nice and buttery, crispy and slightly sweet). Chalazae are cordlike strands of egg white protein that are attached to the yolks–removing them with your fingers is easy and eliminates the need to strain the pastry cream after cooking. The pastry cream can be made a day or two in advance, but do not fill the prebaked tart shell until just before serving. Once filled, the tart should be topped with the fruit, glazed, and served within a half hour or so. 1. For the Pastry Cream: Heat half-and-half, 6 tbsp sugar, and salt in medium heavy-bottomed saucepan over medium heat until simmering, stirring occasionally to dissolve sugar. 2. Meanwhile, whisk egg yolks in medium bowl until thoroughly combined. Whisk in remaining 2 tbsp sugar and whisk until sugar has begun to dissolve and mixture is creamy, about 15 seconds. Whisk in cornstarch until combined and mixture is pale yellow and thick, about 30 seconds. 4. For the tart pastry: While pastry cream is chilling, whisk together yolk, cream, and vanilla in small bowl; set aside. Pulse to combine flour, sugar and salt in bowl of food processor fitted with steel blade. 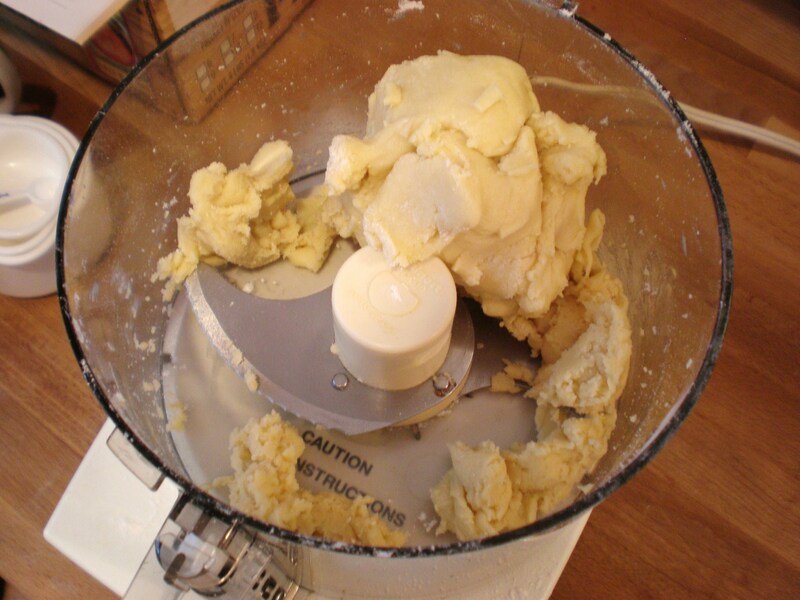 Scatter butter pieces over flour mixture; pulse to cut butter into flour until mixture resembles coarse meal, about fifteen 1 second pulses. With machine running, add egg mixture and process until dough just comes together, about 25 seconds. Turn dough onto sheet of plastic wrap and press into 6-inch disk. Wrap in plastic and refrigerate at least one hour or up to 48 hours. 6. Meanwhile, adjust oven rack to middle position and heat oven to 375 degrees. Set dough-lined tart pan on baking sheet, press 12-inch square of foil inside frozen tart shell and over edges and fill with metal or ceramic pie weights (dried beans or rice work just fine too). Bake until golden brown, about 30 minutes, rotating halfway through baking time. Remove from oven and carefully (VERY carefully) remove foil and weights by gathering edges of foil and pulling up and out. Continue to bake until deep golden brown, 5 to 8 minutes longer. set baking sheet with tart shell on wire rack to cool to room temperature, about 30 minutes. 7. To assemble and glaze the tart: When tart shell is completely cool, spread cold pastry cream over bottom, using offset spatula or large spoon. (Can press plastic wrap directly on surface of pastry cream and refrigerate up to 30 minutes.) Arrange fruit on top of pastry cream, following a design on page 22, if desired. 8. Bring jelly to boil in small saucepan over medium-high heat, stirring occasionally to smooth out lumps. When boiling and completely melted, apply by dabbing and flicking onto fruit with pastry brush; add 1 tsp water and return jelly to boil if it becomes to thick to drizzle. 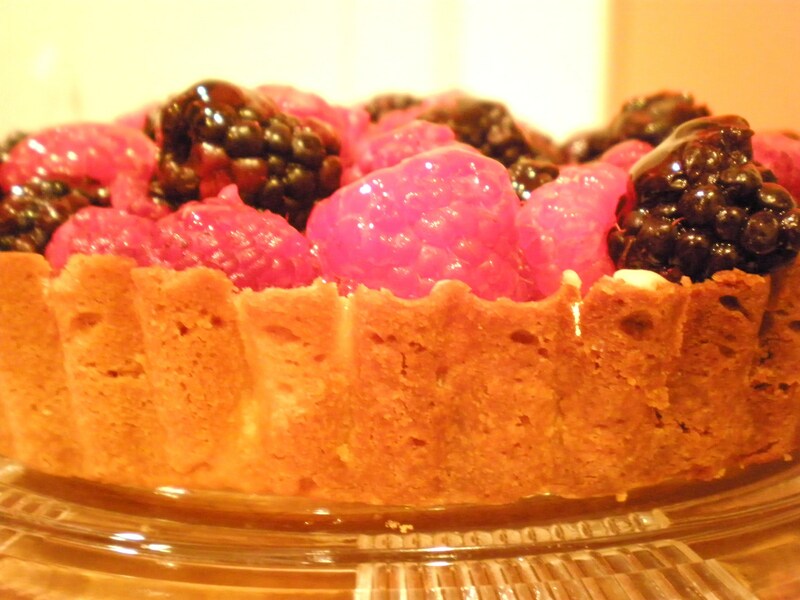 (Tart can be refrigerated, uncovered up to 30 minutes.) remove outer metal ring of tart pan, slide thin metal spatula between bottom of crust and tart pan bottom to release, then slip tart onto cardboard round or serving platter; serve. « Summer Salads – Beat the Heat!